Jaws from Carbon Steel. Duly Hardened & tempered Chrome Plated finish. Specification: We manufacture a wide assortment of multi purpose fence pliers that finds extensive application and is acknowledged for their sturdiness, strength and durability. 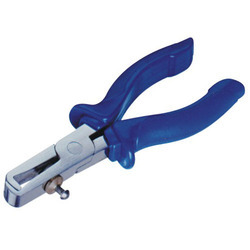 These multi purpose fence pliers are available in hammer hear hardened and tempered. We are engaged in manufacturing, exporting & supplying a broad array of steel strapping Sealers. These tools are made up of high grade raw materials that are delivers from well known vendors in market. Our product range is highly praised by our clients for accurate dimensions & high performance. 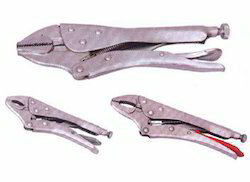 We are a experienced supplier in providing Locking Pliers. Product Description Round and flat beak for bending round and rectangular wires. Useful for bending springs, loops.